3 Kings ,4 Queens 4 Twin,and 3 sleeper sofas . You'll love coffee or cocktails on the private deck while you grill dinner and enjoy the beautiful Sierra Blanca view. In the center of the property is the courtyard, where you'll find gas grills, a horseshoe pit and the hot tub, with lots of seating for hanging outdoors with family and friends. 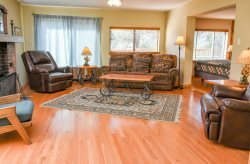 Just below your unit is the Main Lodge, where you'll find the pool table and a very comfortable living area with beautiful flagstone fireplace. You'll see deer roaming the property and don't be surprised to see the VIPs (Very Important Ponies - the Free-Roaming Horses of Alto) wandering through, as well as the occasional fox, elk, jack-rabbits and cottontail rabbits. Bring your camera and your best smile for those nature selfies!